Face Analysis | Become Healthy or Extinct! The face zones shown in the diagram above, are the end points of specific internal organ meridians. Refer the Meridians tab under the Acupressure tab above. 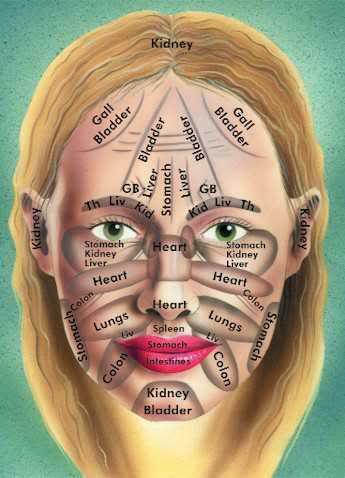 The heat, toxicity and illness energy in organs are passed onto the face zones through these meridians. As per my experience, this diagram is 90% correct. Inorganic substance coatings on the face will affect the internal organs negatively! This is why makeup made of inorganic chemicals can be very harmful. Organic substance coatings like turmeric, organic face pack, organic balms and cucumbers on the eyes or forehead will benefit the internal organs positively! Around these areas on the face, there are indications of texture, puffiness, skin discoloration and even missing facial hair growth. Unfortunately not even half of these indications are described in any one book. What I am detailing below is from my validation of some books and charts and my experience with patients. Skin becoming dark brown at the site indicates biological organism damage or inorganic medicine damage to that organ. Below the lower eyelid if the skin is brown, it indicates Liver damage. Skin becoming black at the area indicates blood flow blockages in that organ. Skin becoming puffy, like as if filled with water or even tiny skin blisters on the area indicates inflammation due to irritation from foreign substance accumulation or biological organism damage or cellular degeneration in that organ. Puffiness below the lower eyelid indicates kidney damage. Skin discoloration indicates that the intrinsic factor of that organ is partly damaged. Intrinsic factor means, the cells of that organ are damaged to some extent and they cannot absorb the nutrition that they are supposed to, thereby causing nutritional deficiencies in the body as well. This is why you will see malnutritioned children always having discolored skin patches on the face. Tiny spots of missing hair growth on the face indicate long-term cellular disturbance to that organ. The cells at that region in the organ are not able to maintain proper cellular pH and electric charge, thereby sending faulty current signals to their corresponding face spots, which destabilize the electric charge at the hair follicle roots. This sabotages the healthy hair growth. This is why smooth facial skin, with uniform color and slight moisture are indications of good internal organ health. Always try to figure out the period from when the indications on the face appear. Consider skin below the lower eyelids becoming puffy. If it is a recent occurrence, then try to see what could recently be affecting those organs negatively. It could be too much of packaged food or a new inorganic sweetener or some new inorganic Allopathic medication like Antibiotics that are silently causing kidney or liver inflammation. Hi Darryl, I read your book and it helped me a lot… Thanks! Glad to hear that Priyanka! Wishing you the best of health! Dear Dhanoo, please attend one of my health workshops. You will learn how to treat your Thyroid with Acupressure and you will also be able to check the health of other internal organs to see what is contributing to your cheeks discoloration. Thank U so much for sharing some wonderful facts about Health, Food & Nature through your book. I WISH U A LONG, HAPPY, PROSPEROUS, PEACEFUL, HEALTHY LIFE. GOD BLESS YOU. Dear Darryl, I have really become enlightened by reading your material and I have been empowered to take full control of my health. Thank you so much for the amazing work you are doing. Can I please have the “face analysis” material in a way that can be downloaded and studied offline.